How do I keep my heirs from having to go through probate? Many consumers want to avoid an estate having to go through probate. Probating my will is something that most people try to avoid by doing appropriate planning prior to their passage. They are trying to reduce the probate charges that the government will charge for the probate process. Let’s start by saying that you should take a will through probate. At the same time taking steps to minimize the cost of probate. Why would you want to probate a will? First it is the legal process that declares to the public that someone has died. Their estate is about to be closed. If there are claimants, this is the legal notice that gives them a chance to make a claim for money owed or to contest the will. While no one wants to deal with this situation, it is better to deal with it legally than face claims later on. Don’t avoid probating my will but do take steps to minimize the charges. 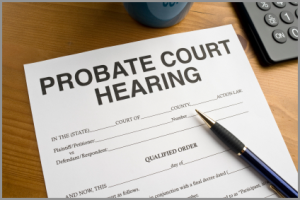 Probate charges vary depending on the location you live in. IN some locations, everything is included when calculating the probate cost. While in many locations there is a deductible with probate calculated on the remaining balance after the deductible has been included. Your challenge prior to your death is to minimize the amount of your assets that will be included in the probate calculation. For example if you own a home it will be included in probate calculations if your spouse has passed away prior to your death. One method many people use to avoid this is to make their home jointly owned with their kids. Joint ownership items pass automatically to the remaining owner and avoid being included in probate. You can apply this approach to many assets. However there are many issues to consider. One area of concern is with a joint ownership with someone, you need to make sure it is someone that you can trust. Not everyone can be trusted in situations like this. Money is very attractive to many people. We strongly suggest that you discuss your options with a lawyer and your financial accountant prior to taking these steps. The first bit of data you need is to find out is the probate deductible. Perhaps you will not need to worry about probate costs at all.